Steve Gibbs remembers how the first Cacklefest&REG; came to be. When the CHRR first started, we had a section of The Grove, behind the pit side grandstands, called "Memory Lane". 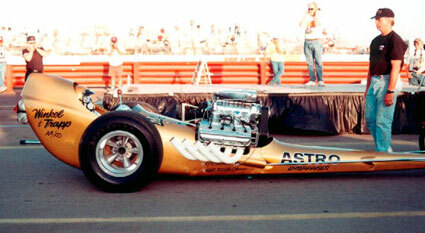 Over the year it attracted more and more old and restored racecars, including The Magicar. In 1999 we started our "Twilight Memorial", with a great deal of assistance from Bill Pitts - including his wonderful idea of firing up (static start) the Magicar after the list of departed comrades was read by Dave McClelland. It was great, and stirred many emotions. It was after that first "Twilight Memorial" CHRR starting line presentation, that the idea began to surface about "rapid fire" push starting a bunch of vintage fuel cars, like the old days of Famoso, as a feature of the 2000 CHRR. It was so tentative that we did not even announce it in pre event promo. When I began to take stock of the existing cars, capable of being push started, there appeared to be about 6 to 8 realistic possibilities, a few of which were "ready to go" (Chrisman, Kuhl & Olson, & G-B-P) Bill Pitts had to put a clutch in his car, and during this period. The Vagabond could be fired, but was not capable of being push started. The Steinegger and Eshenbaugh car was a pleasant surprise and emerged unannounced, but I believe it was ready to go all along. Anyway, when I told Greg that it looked like I could probably put 6 to 8 cars on the track, cackling all at once, he said something to the effect, "we'll have a regular Cacklefest". Little did I know, or appreciate at the time, what Greg's simple play on words would result in. Howard Cam Rattler - Larry Dixon, Jr. 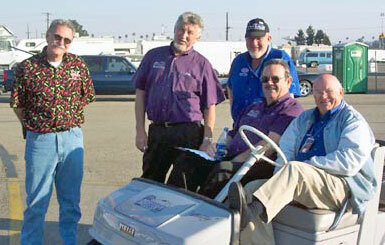 Without these guys there would be no Cacklefest at the CHRR or anywhere else. For the Wally Parks NHRA Motorsports Museum: Alan Miller, Steve Gibbs, George Phillips, Greg Sharp and the late Bob Daniels.